It’s Food Fact Friday. On this day, I reveal an interesting food fact. Today, we’re learning about Cilantro. I’ve been bad about posting my food fact Fridays mainly because a few friends of mine started #ChampagneFriday and it was all downhill from there. So I’m starting up again and this time it’s about a much disputed food – Cilantro. In my small world, it was silly of me to assume that everyone would like this garnish unfortunately there is a Facebook page and a website strictly devoted to the hatred of this bright green sprig. 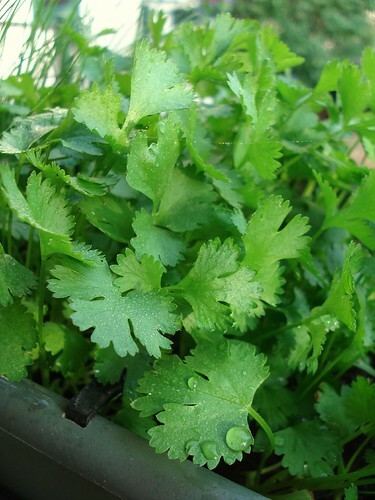 Cilantro is a staple in ethnic households primarily Mexican, Indian, and Chinese. I have fond memories associated with Cilantro. It was my favorite addition to any dish and the smell of freshly chopped cilantro was intoxicating especially when added to any dish and in contact with heat its aroma would burst bewitching my senses. So I have a hard time understanding the extreme hatred for it and especially descriptors like “tastes like soap” and “smells like wet socks.” Really? Who wrecked your palate? Aside from being a garnish or used in sauces or dips, Cilantro has several medicinal properties. It is used as an aid to the digestive system. A poultice of the leaves and seeds can be prepared and applied externally to relieve muscle tension, painful joints and rheumatism. They can also serve as a remedy for a hangover. Might want to think about that the next time you take a drink and think it smells like wet socks or soap. Haven’t you tasted worse? If you’ve got a green thumb, Cilantro is easy to grow at home and have it accessible for all your cooking needs at a whim. It grows fast and can reach heights of 12-14 inches so make sure you have plenty of room in your garden. Only pick fresh leaves; older leaves have a strong and bitter flavor.